FilRight Pro ABS+ filament is the perfect 3D printing material for printing professional quality parts. Because this filament is slightly modified, both the material itself and the printed end product are particularly strong. ABS (Acrylonitrile Butadiene Styrene) filament is durable, light in weight and very easy to print. That is why this filament has been hugely popular with avid users of 3D printers for years. 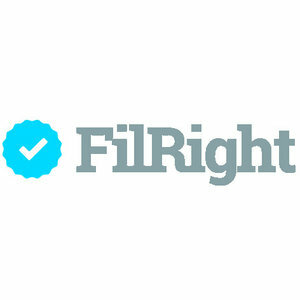 FilRight Pro ABS+ filament is supplied on a 750 gram spool. This filament is available in many different colors and in both 1.75 and 2.85 mm diameters. The desired print temperature is between 235°C and 260°C and a heatbed is required. The recommended heatbed temperature is 80°C to 100°C and we recommend the use of an adhesive for the print bed such as PrintaFix printbed adhesive spray. FilRight Pro ABS+ filament is suitable for almost all (FDM) 3D printers due to the very small diameter tolerance. Are you looking for other colors and spool sizes of ABS+ filament than listed on the website? Then contact us, because these are often available on request. Need more technical specifications regarding ABS+ filament? We have both an MSDS and a TDS available. All FilRight filaments are delivered on a transparent spool, so that you can see the available filament on the spool at any time. In order to prevent possible damage to the ABS+ filament during transport, all the spools are completely sealed and packed in a cardboard box specially designed for FilRight. Want to know more about FilRight Pro ABS+ filament? Then contact us.